On Tuesday, January 19, Terhune Orchards will host the first winter session of their Read & Explore Program at the farm. The topic of the session is The Gingerbread Man. 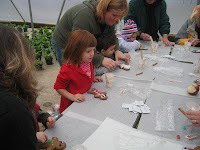 The classic tale of The Gingerbread Man will be read and each child may decorate a large gingerbread man cookie to take home. The children will be able to see how many ingredients of the gingerbread man come from farms. Read & Explore is Terhune Orchard's winter education series with sessions in January, February and March. The program combines reading stories and doing related craft activities. Parents/guardians and young children (ages preschool to 8 years) are welcome. The sessions begin at 10:00 am and last about one hour. Each session costs $5.00 per participating child, which includes the materials for the activity. Parents should call ahead to reserve a space. The number at the farm is 609-924-2310. Check-in is at the farm store. Children must be accompanied by an adult. Terhune Orchards is located at 330 Cold Soil Road in Princeton.